Wonderful weekend to get my first look at the Farmer’s Market in Travelers Rest, South Carolina. I had anticipation and excitement about seeing what over 60 vendors had to offer in the Upstate. I was impressed with the entire organization of the vendors and pedestrian pathways. Greenbriar Farms was first as you enter the market and they had plenty of greens and vegetables for customers. Upstate Provisions, a Travelers Rest eatery, was at the market with free samples of a vegetable salad and fresh bread. I met Josh and Melissa Smith who own and operate Fraylick Farm. Transplants to the Upstate from Columbia, they offer humanly raised, organic, pastured local pork. I purchased their Sweet Italian sausage links and Onion Pork sausage links made from Heritage Pigs. They also offer bacon and chops. I am always on the hunt for a GREAT olive oil, Hellenic Ladi, LLC is my latest find. Made in Greece from the Aetolia Region in western Greece, it is a single varietal, using fruit from olive trees called Koutsourelia (meaning large trunk). This is the only type of olive that is used to produce ORENO HELLENIC LADI resulting in a single varietal (meaning only one type of olive is used) EVOO (extra virgin olive oil). “Oreno” means from the hills, the olives are processed within 24 hours of picking and are bottled in the same facility, ensuring quality and quick farm to table cultivation. The olive has a very clean, crisp taste and very lite on the palette. This oil will be reserved for dipping, not cooking. sweet. It pairs perfectly with a fresh cup of coffee, which was available at the market. Rain hampered several vendors from arriving at the Taylors market and only 12 were present. Hoping this Thursday will be better. The largest market I visited this week was the “Saturday Market” in downtown Greenville. There must have been close to 100 vendors. Everything from soap to candles, produce to specialty foods was available for foodies. My favorite vendor, Upstate Greens was there and I once again purchased broccoli micro-greens and arugula micro-greens. Naked Pasta provided prepared sauces and pasta. 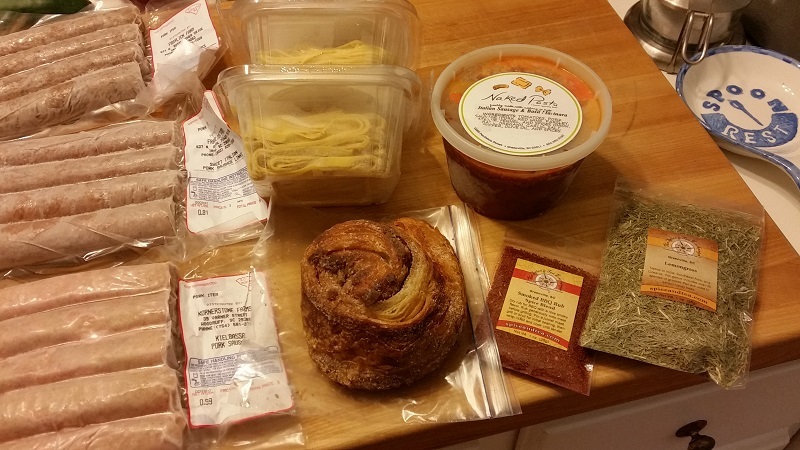 Customers can purchase a package deal buying two types of pasta and one sauce, all made by hand in their Greenville shop. Overall, it was a very successful day. I will be visiting some other Upstate farmers markets as the season gets into full swing.